I think we all know Florida is what we might call a special place. 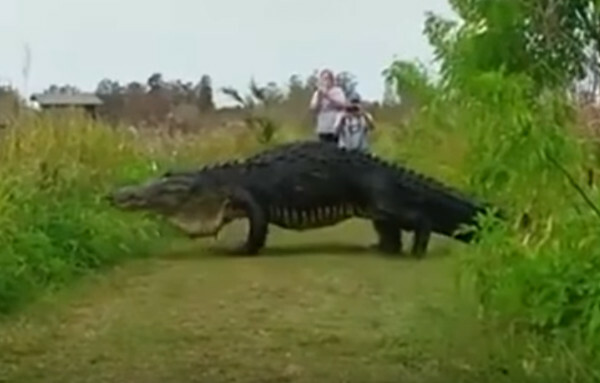 But the sight of an enormous alligator just out for a stroll in a Polk County park takes on Jurassic Park themes. Even better are the tourists just standing and watching the beast as he crosses the trail. These giant gators are truly prehistoric animals. Somehow they’ve managed to thrive through millions of years, with distant cousins that roamed the earth with Tyrannosaurus Rex. So when a gaggle of camera phone wielding tourists are shocked to witness such an absurdly large animal, just standing there gaping at the sight, it becomes clear the dinosaur element has a hold on the Sunshine State. This gator was estimated to be 15 feet long. That’s as long as an SUV. And the way he strolls, with an attitude that says “I care nothing about you,” just confirms his status in the food chain. It’s also interesting the way his legs and feet flop and strain under the weight of his reptilian heft. Of course, many are suggesting the clip is a fake, but it’s not. This is a real gator that lords over his domain, dining on small deer, cats, and possibly disoriented poachers.